Respiratory PPE can become contaminated if not properly cared for and maintained. Personal Protective Equipment, also known as PPE, is an integral part of minimizing the exposure to hazards in various lines of work, whether these hazards are airborne or not. Respiratory PPE can become contaminated if not properly cared for and maintained. However, numerous persistent myths surround these respirators, and they need to be debunked to ensure that workers will remain safe and healthy at all times. The Occupational Safety and Health Administration has guidelines for when respirator cartridges must be changed. But according to the myth, some workers think they know it’s time to replace a cartridge when they can taste or smell the chemical. OSHA requires that companies keep a change schedule and adhere to it at all times. It’s possible that given enough time, workers will become desensitized to the taste or smell of certain chemicals and therefore, their reaction to such substances can’t be trusted as the primary indicator for changing cartridges. Some people believe a myth that employees who voluntarily use respirators don’t require the company to establish and maintain a respiratory protection program. The fact is that there are certain parts of the respiratory protection program that need to be established, depending on the type of respirator that the employee is wearing. For example, if an N95 respirator is being used, the employee must be given a copy of OSHA’s appendix D or state equivalent. In this case, the employee must then select the appropriate respirator and ensure that it is kept in clean operational condition. This myth states that a half mask and indirect vent goggles can be used when working with formaldehyde. The truth, according to OSHA, is that employees must be issued full-face respirators that feature canisters or cartridges that have been approved for use with formaldehyde. They must also be air-purifying. In some cases, a full-face respirator may be substituted with a half-mask respirator as long as it is air-purifying and accompanied with a cartridge approved for work with formaldehyde and gas-proof goggles. G&M Services has a great amount of expertise, experience, and training when it comes to demolishing concrete, so trust us with the job. We understand how dangerous our important work with concrete can be, and we take safety precautions every minute of every day to prevent anything disastrous from happening. 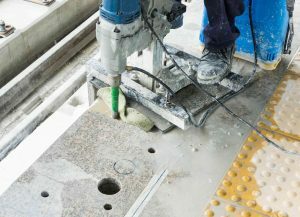 We offer many different services to our valued clients, including concrete drilling, concrete scanning, and FireStop. For more information on our services, contact us online or give us a call at (410) 787-8828. For more safety tips and interesting articles, follow us on Facebook, Twitter, Flickr, and LinkedIn. This entry was posted on Friday, January 5th, 2018	at 12:10 pm	. Both comments and pings are currently closed.